North Sea Poetry Scene founder and longtime poetry advocate Tammy Nuzzo-Morgan, a former Suffolk County Poet Laureate, has been named the Long Island Poet of the Year by the Walt Whitman Birthplace. She will receive the award at Walt Whitman’s Birthplace at 246 Old Walt Whitman Road in Huntington on April 23 at 2 p.m. The Long Island Poet of the Year is an annual award given by the Walt Whitman Birthplace Association to honor a notable poet on Long Island who is well known and well respected. Her awards include the Mobius’ Editor-in-Chief Choice Award and the LIWG Community Service Award. She champions poetry through her writing, teaching and support of the Long Island community of poets. 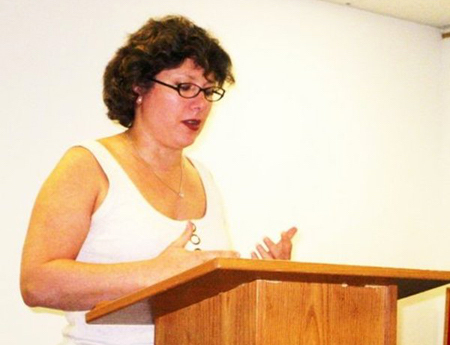 Mrs. Nuzzo-Morgan lives in Southampton and is professor of humanities at Briarcliffe College in Patchogue. She has been resident poet for the Southampton Historical Museum for the last 10 years. Her poetry writing workshops and readings by East End poets are held at the 1843 Rogers Mansion and the 1648 Thomas Halsey Homestead. In July and August of 2017 she will host a series of Readings at Sunset at the Homestead. Tammy Nuzzo- Morgan is an especially talented poet who deserves the title. She has worked tirelessly toward gaining respect for LI poets. Is your organization accepting poetry submissions, by any chance? Yes, we are! They can be sent to poetry@eastendbeacon.com. Please spread the word! We members of the Long Island Authors Circle are immensely proud of our recently elected member, Tammy Nuzzo-Morgan.